Tea tree oil, also known as Melaleuca oil, has a rich history of treating scalp and skin conditions, because of its strong anti-fungal properties. The Aborigines in Australia have been using tea tree leaves for over three hundred years to treat cuts, infections and burns. But, it wasn’t until the oil was distilled from the leaves that the more concentrated, potent product began to change the face of medical and personal care. An element of tea tree oil known as terpinen-4-ol is thought to be one of the strongest antiseptic and antibacterial compounds around, and as a natural botanical, tea tree oil is a safe and versatile remedy for a host of topical conditions. One of the first uses for tea tree oil was as an antiseptic for scrapes and burns, and today, people are still taking advantage of its antiseptic qualities to soothe and treat mild injuries. As with any natural oil, you should test a small amount on your wrist and wait for any allergic reactions. When you are convinced that it is safe for use, apply the undiluted oil sparingly when you get a cut, bruise or burn, and continue reapplying everyday until you see signs of healing. If you feel a burning sensation, the tea tree oil can be diluted with a small amount of olive oil. The anti-fungal properties of tea tree oil are perfect for dealing with dandruff and dry, itchy scalp. While a large number of commercial products have incorporated tea tree oil in to their hair care line, using the essential oil to boost the effects of regular shampoo is a valuable addition to your routine. For dandruff, massage a small amount of tea tree oil in to your scalp before shampooing, or simply add the oil to your shampoo. If you have problems with frizzy or dry hair, rub the oil between your palms and slowly massage it in to your hair, then style as usual. When a disproportionately high level of bacteria is concentrated on the surface of the skin, it creates the perfect environment for an acne breakout. 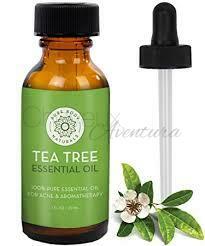 Tea tree oil is an effective topical remedy that attacks Proprionbacterium acnes, the bacteria that causes acne. Just dilute it with water, down to five percent, and apply it directly to the skin. One of the advantages of tea tree oil, as opposed to traditional medicines like benzole peroxide, is fewer side effects like itching and dryness. More and more people are using it as a natural approach to fighting acne. One of the most popular uses for tea tree oil is using it to fight athlete’s foot. The powerful, natural anti-fungal is a cost-effective way to both heal and prevent the condition. Take one half cup of arrowroot powder or baby powder and add forty drops of tea tree oil. Mix thoroughly and divide evenly between two clean, white socks, and wear them while you sleep. You can also use a small amount of powder and wear them during the day.